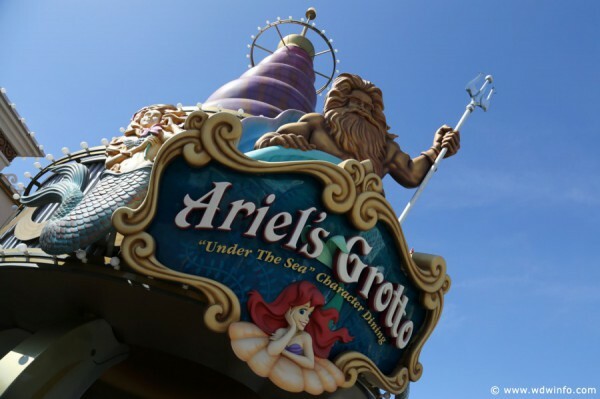 Ariel’s Grotto is located on the boardwalk to Paradise Pier in Disney California Adventure. Breakfast is served 9 to 10am and reservations are highly recommended. 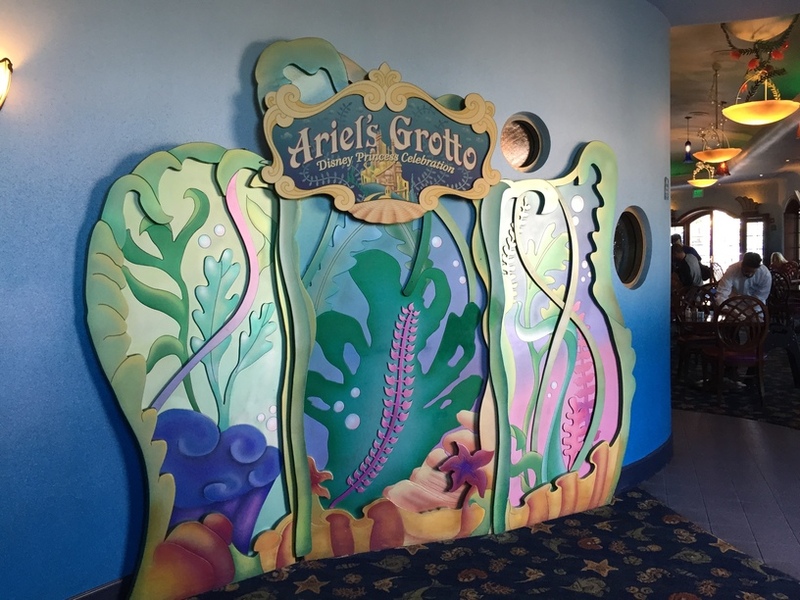 Even from the outside, you can tell that Ariel’s Grotto is a special place for Little Mermaid fans. As a girl who grew up in the 1990s, I’m a pretty big one. When you walk in from the pier, you check in at a counter in a small waiting area. 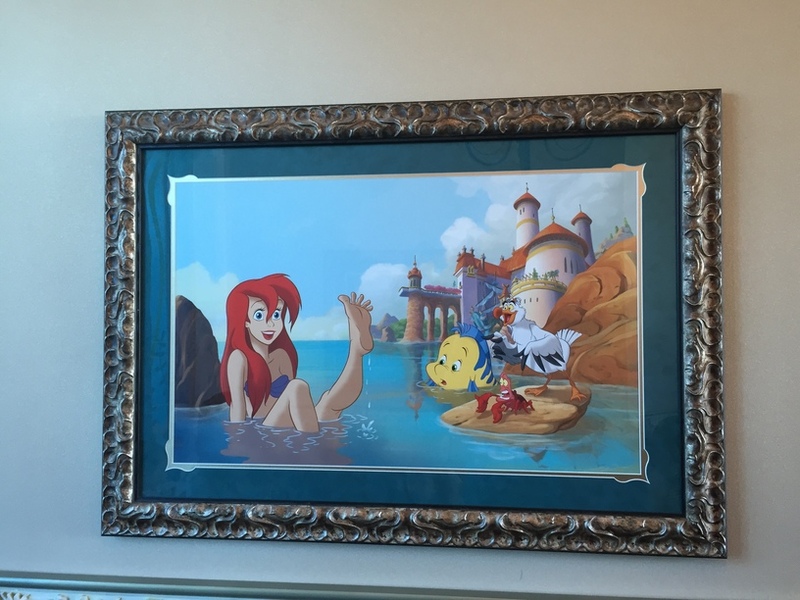 Around the waiting area are paintings of scenes of the movie featuring everyone’s favorite princess, Ariel. We arrived for our 9:30 reservation right on time. Unlike some other character meals at the Disneyland Resort, you don’t pay up front here. Breakfast is $42 plus tax and tip. (Lunch is a few dollars more). There were a number of families waiting on the stairs to take their picture with the star and be seated in dining room downstairs. As a party of two, we were taken in an elevator downstairs, had our picture taken, and were seated right away. Our waiter was nice and efficient. He helped us track down the PhotoPass guy when we decided we wanted to buy the photo after we had told him we didn’t. I enjoyed my American breakfast of eggs and bacon. The scrambled eggs were better here than at the character buffet breakfasts at the Paradise Pier and Disneyland hotels, but still not amazing. The fruit platter for the table was delicious. The pastries were average. 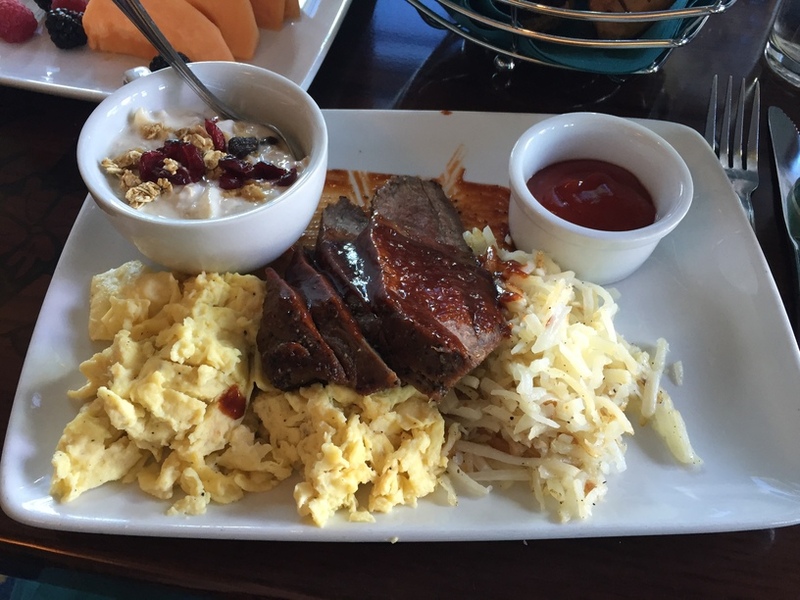 My husband liked his barbecue tri-tip and eggs. The real draw here is the princesses and the location. The location is great. 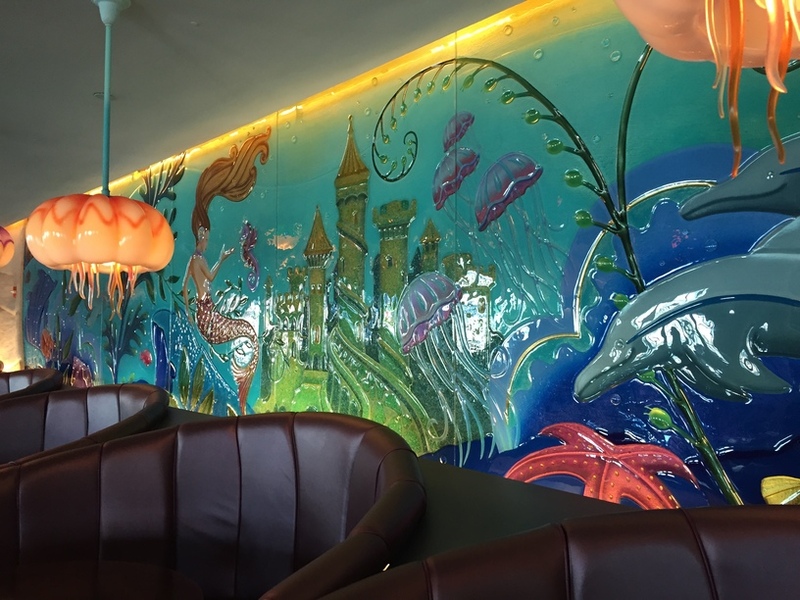 You really feel like you are under the sea with the mural on the back wall and the sea creatures hanging from the ceiling. 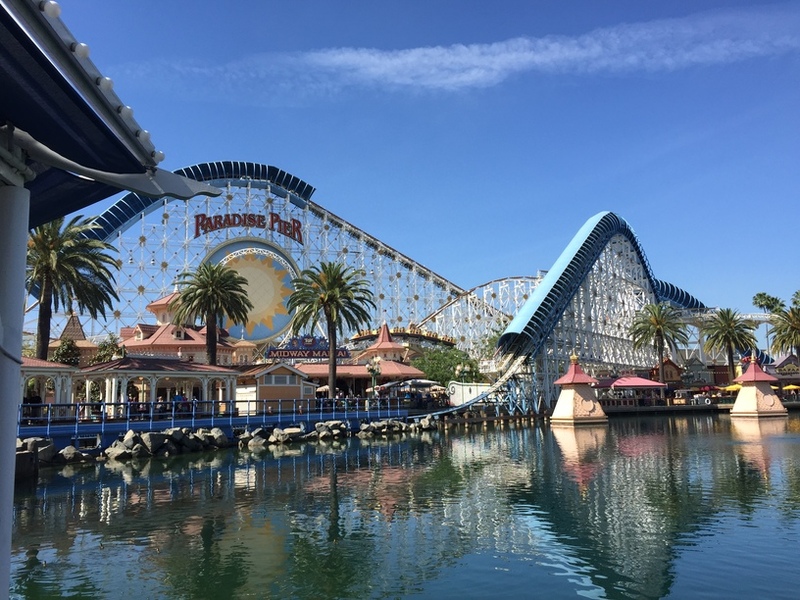 The picture windows also allow a wonderful view of Paradise Pier including Mickey’s Fun Wheel. The light coming in from the window can hurt your photos, so be aware of that when the princesses arrive. I was underwhelmed by the theme of the restrooms; the blues nicely match the under the sea theme and there are some royal looking mirrors, but there could be more. 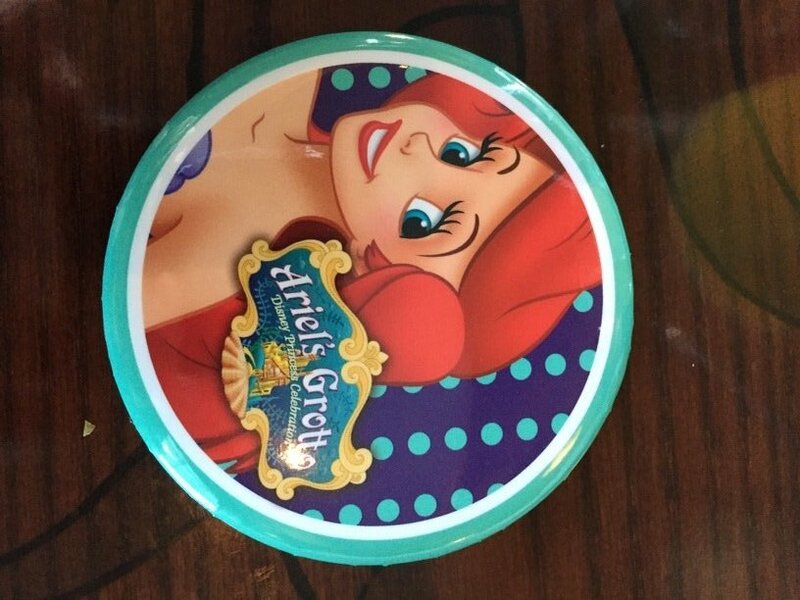 The first princess you see is Ariel, before you get seated. Despite you being under the sea in her grotto, she is post her conversion to human princess. When we were seated, Belle, Rapunzel, and Cinderella were all already making their rounds to the tables and came to ours shortly. Princess Tiana was also announced and started circling after we sat down. This announcement is similar to what they do at Cinderella’s Royal Table. This is the only one we saw so if seeing all their announcements is important to you or your little princess (or prince) you might want to make a 9 o’clock reservation. At this time there are no pre-park opening reservations, unlike most character breakfasts in Walt Disney World. I didn’t know who to expect for additional princesses beyond Ariel, since it can vary. I really enjoyed the princesses we had, especially getting to meet and take photos with Rapunzel and Tiana. I couldn’t get over seeing Rapunzel’s beautiful hair with the flowers tied in and the volume on Tiana’s ball gown. Those are princesses I haven’t met before despite going to Cinderella’s Royal Table and Akershus Royal Banquet Hall. 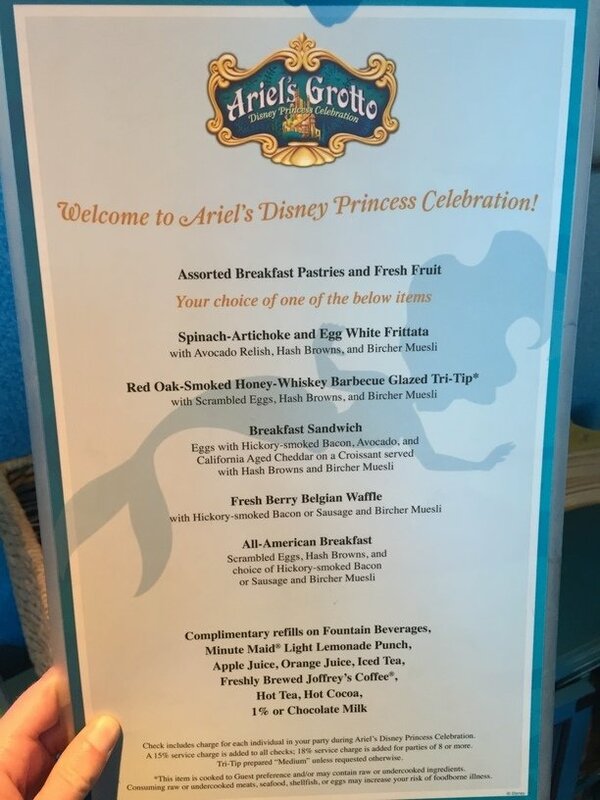 Overall, I’m very glad we went under the sea to Ariel’s Grotto for breakfast. I also appreciated the included souvenir pin!